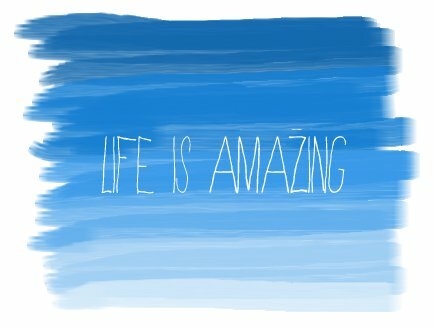 A few weeks ago I was driving home from an event that I spoke at and this one thought kept going through my head: “My life is amazing!” Since then I have thought more about that and why it is such a true statement for me. My life is amazing for a lot of reasons, but I want to share the top reasons with you. 1) I have a strong relationship with God. Having this relationship shapes the rest of my life. It is what completes me as a person. I pray that you have that kind of relationship with God and if you don’t that you can develop one. 2) I love my wife. On November 5th of this year my wife, Ashley and I will celebrate our second anniversary. I can honestly say that the past two years have been the best years of my life. Everything in my life that isn’t great is better because I have this special person to spend my life with. 3) My work is also my passion. I love what I do for a living. It is not really a job or work at all. It is simply what I know I am called to do with my life. I love helping other people accomplish their goals. I love helping to build up leaders who will make a difference in our world. I also get to work with my family, which truly is a blessing. 4) I have wonderful parents who are great role models for me. I always know that they are there for me and I have so much love and respect for them. 5) I have great people (family and friends) who support me in everything that I do. Last year I was in a bad car accident and it was so helpful to have these people there for me through everything. To all of those people (they know who they are), my life is amazing because of you. Those are just five of the reasons why my life is amazing. I don’t write all of this to brag. I write it because I hope that your life is amazing as well. I hope that you can count your many blessing. Things are not perfect in our world right not. Nor are the perfect in our country. But we should thank God everyday that we are alive. We should thank him for all of our blessings. We must understand that 90 percent of life is awesome, while 10 percent is not so great. I choose to focus on the 90 percent, which is why my life is amazing. What do you focus on?